Australia has over 1500 Native Bee Species. There are around 200 known species endemic to the Sydney region. Each native bee individually contributes to pollinating and maintaining indigenous biodiversity. The world’s bee populations are in trouble, through colony collapse disorder, predator beetles and a broad range of factors that relate to our lack of care for the Earth. 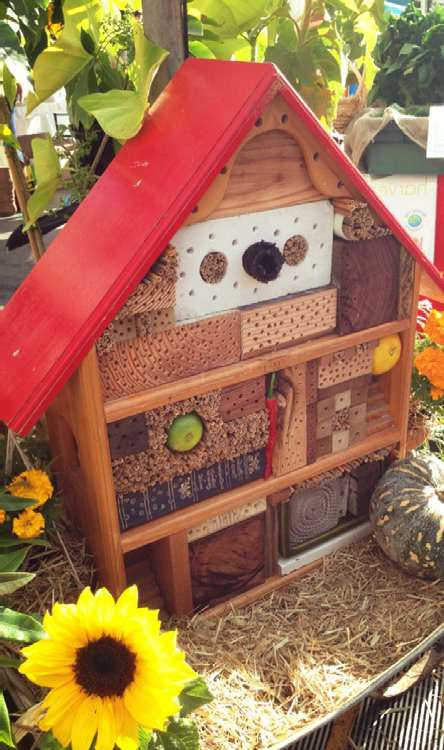 Encouraging native bees into our gardens and community helps an integral part of our ecosystem. Our social native bees are stingless bees and cannot harm you. All the other native solitary bees can sting, although most species are too small to deliver an effective sting and Australian native bees are not aggressive. 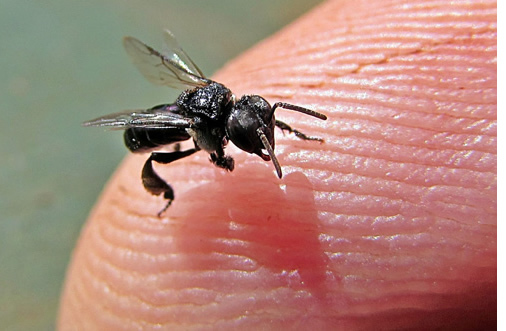 If a larger native bee is picked up, trodden on or threatened it is capable of stinging. A native bee can sting more than once, and it is possible to be allergic to the sting, so please treat native bees with respect. Do native bees make honey? Australia’s ten species of social stingless native bees do make and store small amounts of aromatic honey. This honey has a delicious, tangier flavour than the commercial honey produced by European bees. Stingless bees are primitive species which make small amounts of stored honey in small resinous pots. In cooler areas, such as Sydney, they need most of their honey to get through the winter months. Furthermore, if even a small amount of honey is spilt in the nest, the bees can potentially drown. Where special techniques are used in warm areas of Australia, honey production with stingless native bees is achieved. ‘Sugarbag’ honey is a rare product to be savoured because each hive only produces about 1 kg of delicious honey nectar per year. Commercial honey bees were introduced from Europe in about 1822, and are not native to Australia. How to attract native bees to my garden? Urban development and landscaping can destroy food sources and existing nest sites and habitats, threatening native bees. Our bees are a precious resource for the future pollination of our bushland and crops. You can help by planting nectar-rich flowers and providing new nest sites in your garden. You can also protect the bees by not using pesticides or insecticides which are deadly to bees and our precious ecosystem. Great plants for attracting native bees include: Abelia grandiflora, Angophora, Baeckea, Buddleja davidii, Callistemon, Eucalyptus, Grevillea hybrids, Hardenbergia violacea, Lavandula, Leptospermum, Melaleuca and Westringia. A bundle of bamboo canes, dried mud bricks or a block of hardwood drilled with holes (4 to 9 mm wide and 150 mm deep) can also provide valuable nest sites for your local solitary bees. This tiny stingless bee (3 - 5 mm) is the only native species, in Sydney, that lives in a social colony and makes honey. The queen bee lays all the eggs, and the thousands of sterile female worker bees and male drone bees work harmoniously in building, maintaining and sustaining the colony and its hive. The bees’ hive is usually nested inside hollow trees, branches and logs. The nest is constructed from cerumen, a dark brown mixture of wax (secreted by the workers) and resins (collected by the foragers from ‘bleeding’ trees). Pollen, nectar and honey are stored in clusters of small pots around the edges of the nest. In the centre, the queen lays the colony’s future eggs, in hexagonal cells within a horizontal spiralling brood comb. Native Bee enthusiasts have developed techniques for keeping these unique bees in specially constructed hive boxes. Colonies can then be propagated by splitting a single hive in two. This will help to conserve and re-establish colonies of stingless bees back into urbanised areas.